← My shutter speed was….fast? This past week has been a bit rough of this old bird. I’ve just been feeling so run down during my workouts, like everything is much more of an effort than it used to be, and I was pulling in split times much slower than I used to. Common theory is that I’m overtraining, which is possible, although, I just didn’t believe it (3 days running, 2 days crossfit, 2 days rest…isn’t a lot is it?). I also figured it might also be attributed to what I was or wasn’t eating. 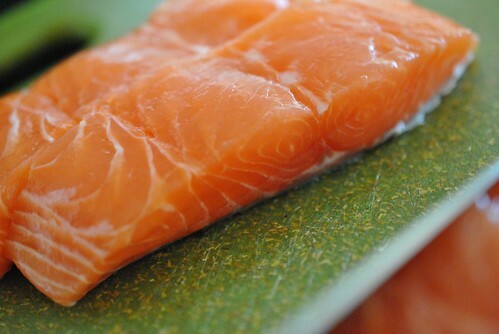 That day at work, while I was wondering what I wanted for dinner that night, I suddenly found myself craving salmon. Salmon sounded good. Protein and Omega-3 right? This was when I suddenly remembered this dish my mom makes that I love. 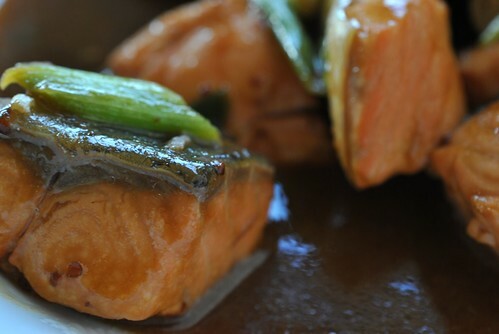 It was simply some salmon chunks marinated in a honey mustard marinade and cooked with some scallions. Simple, only three ingredients. First cut up the salmon fillet into equal sized chunks and place in a bowl. 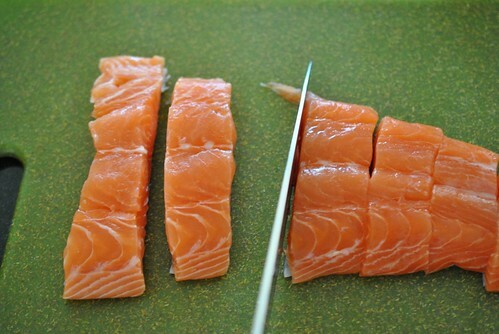 Pour enough of the marinade to reach the top of the salmon and let sit for 20 minutes at least. Heat up a pan with a little oil. Once it’s hot, gently add in the salmon chunks skin side down. Once it starts getting a little lighter along the sides, flip over the chunks and pour in the rest of the marinade from the bowl. 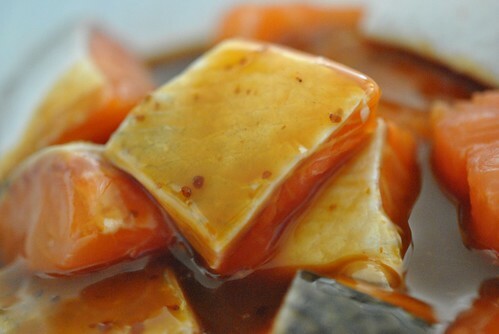 Cook until the salmon is done (flakes easily when you press on the chunks). The best part of this is that salmon cooks fast, so you can have something nutritious for dinner in a flash. 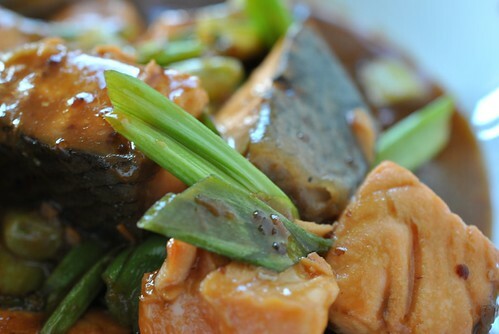 I like eating this with brown rice and a side of yau-choi (dark green Chinese veggie). 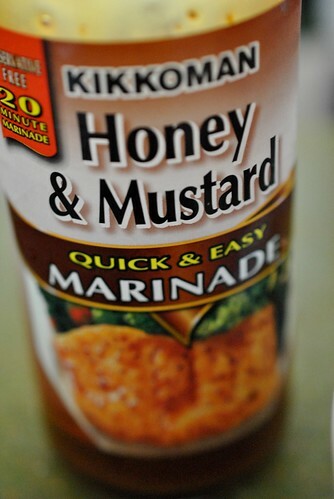 This entry was posted in Dinner and tagged Honey, Mustard, Salmon. Bookmark the permalink. Very true! Or even on a grill! This sounds really good. I always forget about using marinades on fish, I usually go the salt and pepper route. But if it only needs about 20 minutes, I can wait that out! Totally worth the wait! And the sauce goes great with rice!